Is your social presence Creditable? Paid Ads on a social channel is a great way to indulge more traffic to your site and increase your business, but it can become uneconomical if you aren’t careful. Now the question arises that how you can make sure your paid Ads are performing as the way they should be. 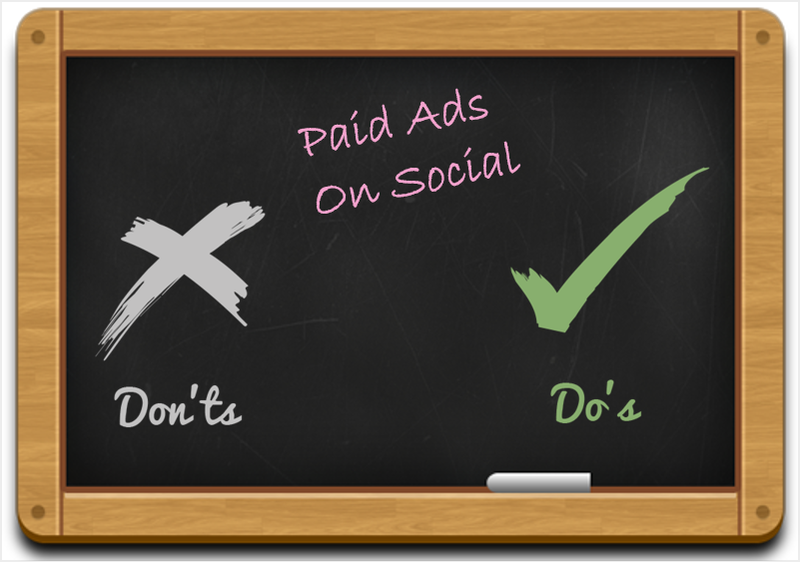 Here are some essential do’s and don’ts that one must follow for paid ads on a social channel so that it can help you to enhance your business and grow productively. Set your Goals: This is the most important task before posting any ads on the social channel because the ultimate aim of anyone is to generate business.One should set SMART goals. Define your Target Audience: Social media platforms provide dynamic tools for targeting who sees your ads. Depending on the platform, one can target by interests, royalty, age, geographic area, buying habits, and more. So one should analyze to identify the quality of their target audience. Craft ads intelligently: Ad must be condensed, CTA should be strong, images must be used, in whole ads should be impressive that grab attention of the audience at first. Rotate Ads Periodically: When people see the same ad too many times they get bored and they stop clicking it. So you should remember that you should be active but should not over- do the things. The best practice you can follow is to rotate your ads every 3 to 5 days to keep our content gleaming and captivating. Originality: Be creative with your posts. Help people know what makes you distinct from the competition. Especially when your goal is to bring in customers, catch the eye and make people remember you. Target by keywords and hashtags: Use keywords that are most commonly used by an audience. Moreover, hashtags scream high user engagement. Monitor your result: Social channels provide a feature to track how our ads is performing. By using this features one can get feedback that got positive response by users and the one that needs an improvement. Time does matter: Pay attention to analytics. Find out when followers are most active on social media and post information during those time frames. Liking your own posts: Don’t ‘like’ or ‘favorite’ your own post. Don’t delete negative comments: Accepting negative comments shows a company is dedicated in resolving issues and aim to serve customers. Don’t connect with everyone: It’s not mandatory that if someone follows you, you should also need to follow them. You should connect with someone that represent your business in a good way.